For those who enjoy decorating their home, a new season means new decor and new color schemes. 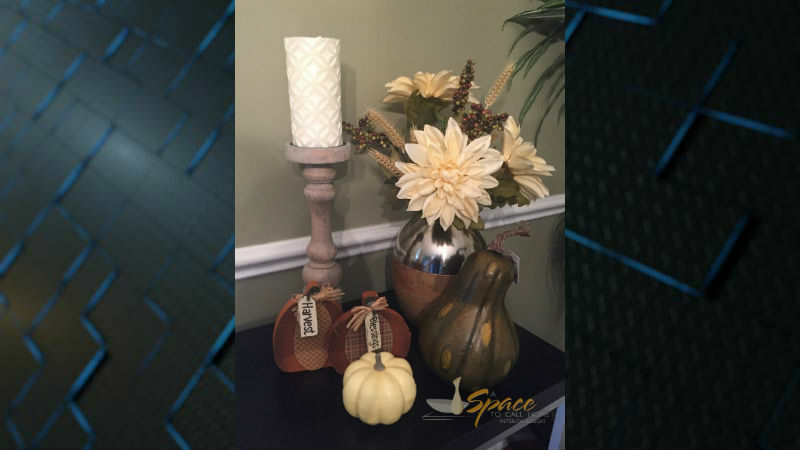 Interior Designer Rebecca Mickler from A Space To Call Home Interiors created a list of things to consider when redecorating your home for the fall season. Begin by making a design plan. As a first step, decide whether you want to decorate with traditional fall colors like reds, gold, orange and brown or with a more neutral palette with colors like white, crème, tan or gray. An easy way to decide is to look at what you already have and select a scheme that will complement, rather than clash with the rest of your house. . If, like many Eastern NC residents, your home décor falls into a more coastal/cottage category, a neutral fall palette will compliment what’s already there. What rooms are you going to decorate? Some popular spaces for fall décor are your front porch, living room, dining room and kitchen. If you’re planning on decorating the exterior, look at sprucing up with seasonal plants like mums & ornamental cabbage & kale, pumpkins on the steps, maybe some cobwebs on your mailbox. Inside your home, areas like the fireplace mantel, dining table, built in bookshelves and tops of kitchen cabinets are great places to display festive décor. Once you’ve decided where you want to decorate and what colors to use it’s time to find some inspiration. Home décor magazines and websites like Pinterest and Houzz offer tons of decorating ideas. Find an image that speaks to you and make a list of items you will need to achieve that look. Really try to break down what about the image you like, what you might change and how you could put your personal spin on it. Often times, decorative items like candle holders or vases can be easily updated with different candles or floral arrangements to reflect the current season. Save some money by reusing items you already have somewhere else or in a different way! Take your shopping list and inspiration images (saved on your phone) with you when you start shopping! Local home décor and home improvement stores offer a huge selection of decorative items and plants to help you achieve your look. I always “over-buy” when purchasing accessories, knowing I can return the items that don’t work. It’s great to have options to play with.